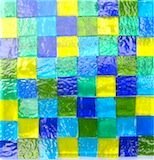 How to make a mosaic glass coaster in a glass fusing kiln using clear and colored glass. This mosaic glass coaster is made from clear art glass overlaid with transparent colored glass squares. The glass coaster has been made from COE 90 fusing glass, it can also be made from COE 96 glass. Coaster dimensions may be varied to suit your glass kiln. Squares can be color co-ordinated or in random transparent colors. Step 1. Cut two 1 x 4 inch square pieces of clear fusing glass. Step 2. Cut 64 x 1/2 inch color squares. Cut 64 x 1/2 inch color squares. Step 3. Glue one row of glass squares along the top edge of the clear glass, glue another row down the left hand edge of the glass. Step 4. When the rows are dry begin to lay out the rest of the squares on the clear fusing glass. Apply a small amount of glue to each square to hold in place. Step 5. Wait until the glue has dried and then place item on prepared kiln shelf. Step 6. Place shelf in glass fusing kiln and fire to this suggested schedule. Fusing schedule may need to be varied to suit coaster size and kiln type. Remove from kiln at room temperature. Check edges, with this type of design the edges may require grinding if they are very uneven. After grinding fire polish coaster for a shiny finish. The following schedule can be used for a two-layer glass project. Thicker glass will require a slower schedule. 1. 300°F (167°C) up to 1100°F (593°C) hold 10 minutes. 2. 350°F (273° C) up to between 1350°F (732°C) and 1375° (746°C), hold for five to ten minutes. Check to ensure that the temperature and hold time is not distorting the glass edge. If so move to stage three immediately. When cool remove from kiln, the piece should now have, a shiny fire polished finish resulting in a nicely fused glass art coaster. For variation this coaster can made from opaque glass squares fused to a contrasting art glass base.